Press release, Moscow, 19/01/2018: General Director of the RILOS company Arnaud Trousset, editor of Geomatrix, an online SaaS predictive analytics solution for the retail industry, and proud member of #frenchtechmoscow committee and #Skolkovo, gave an interview to the DécryptaGéo, geographic information Geomarketing. The historian and geographer by education Arnaud Trousset has lived in Russia for fifteen years. After working on the development of Auchan, he created in 2010 his own research company. A quick question arose about the tools that allow the heads of development departments to automate certain tasks, such as calculating the correct location, researching location accessibility. Today, at the head of Geomatrix, he offers an online analytical SaaS solution to solve problems related to retail trade: site selection, capacity assessment, organization of marketing campaigns. “In all countries, the needs are the same, but the data diverge,” explains Arnaud Trousset. After studying in France, and worked in Azerbaijan and Russia, the young Frenchman knows what is at stake. Developers everywhere need to create reports to analyze the relevance of their networks, open branches or stores in the right locations. “The population, the level of wages, density … is the minimum required,” – adds the founder of Geomatrix. But in so-called “developing” countries decent databases are not available, with which a small team of specialists has learned to cope with easelly. For example, in Ho Chi Minh City, population statistics are available only at the neighborhood level, where live around 10 million people in the capital. Geomatrix offers three levels of analysis. “We work with aerial photographs to create a residential background, digitizing buildings. Then we select a gradient based on the type and number of floors in order to predict the population size, “says Arnaud Trousset. The team also searches for points of interest (POI) to improve the population’s assessment and understand the structure of the business. Data sold by telecom operators is not very useful and too expensive for retailers. As for those that are obtained through geolocation applications, they usually come from the places of residence where applications are used most. “To have a good level of detail of the human flow on the street, there is nothing better than installing a camera.” Thus, it requires intelligent thinking to create coherent data on the scale of the microzone. Real estate objects, POIs from various databases, local open data … everything is carefully studied to get a set of framing data and a good business vision. A team of six people uses independent cartographers to create adapted background maps. “We started with the main cities of Russia, now we cover in detail 265 cities around the world. Last year, we released 67 international capitals. The data is available on three levels: the country, the equivalent of IRIS (about 5,000 people) and a 400-meter tile grid, roughly equivalent to a 5-minute walk distance. Another problem is related to the budgets and skills of clients. Few companies can afford geomarketing specialists who can use sophisticated software to build detailed analysis. Budgets are tough, employees are unstable … so Geomatrix has opted to simplify this process. An example of the first page of a report published with a few clicks of Geomatrix. The solution is available only by subscription in the Cloud with a price that depends on the level of detail of the analyzes. 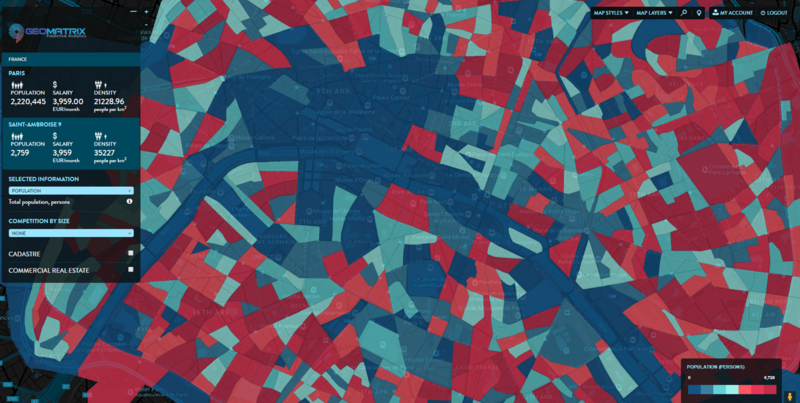 It integrates the Carto API and is available in various operational scenarios. Thus, the user can select the necessary implementation by opening the most consistent microzones with its key performance indicators. The program will take into account the affected population, incomes, competitors of the selected sector, points of interest … Evaluation allows you to approach the issue by weighing the microzone in accordance with performance indicators to find customers with high potential, Geomatrix is also used to calculate availability areas based on HERE data, to assess the size of the market for each point. For each question, you can analyze and compare several scenarios. Then the reports are edited in PDF format. 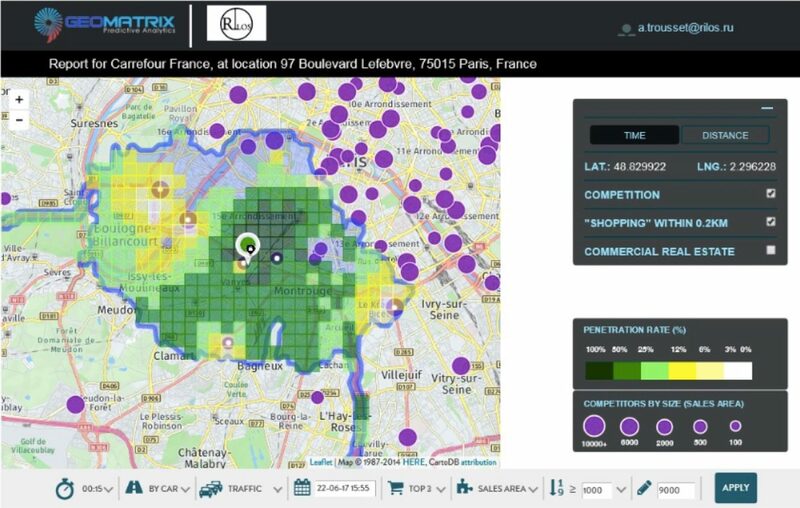 Member of the FrenchTech Moscow Committee, Geomatrix solves the problems of geomarketing with a clearly business oriented approach and a method that uses all available data. Castorama and Ikea in Russia, Auchan in Russia, Hungary, Ukraine and Vietnam … the company works both for large retailers and for smallest retailers such as chain language schools. Today, Geomatrix aims to gain a foothold in the French market and recruit partners and distributors.